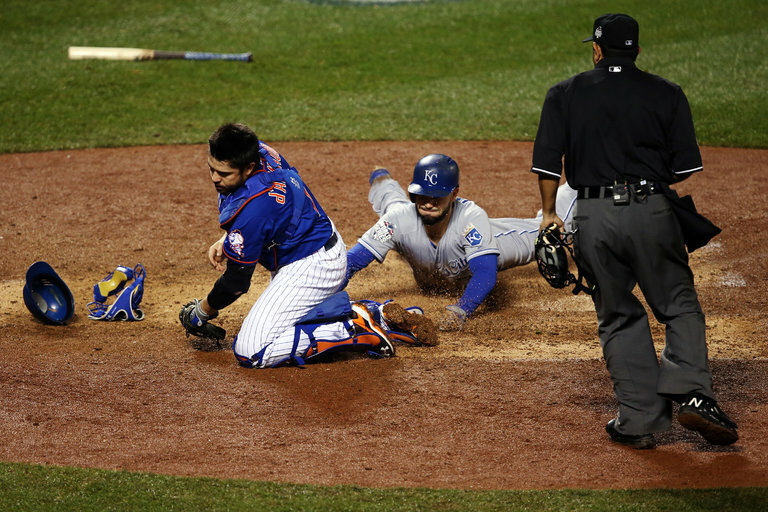 The Royals’ Eric Hosmer scored in front of Mets catcher Travis d’Arnaud in Game 5 of the 2015 World Series on a bad throw by Lucas Duda. The Kansas City Royals return to Citi Field on Tuesday night for the first time since they ran away with Game 5 of the World Series and clinched baseball’s championship. The game turned on one play: Eric Hosmer’s daring dash to home plate in the top of the ninth with the Royals trailing by a run. Eight months later, a lot has changed for most of the Mets players who took part in that sequence, and not for the better. To set the stage, Hosmer was on third base with one out and the Mets trying to hold on to a 2-1 lead. Jeurys Familia was on the mound for the Mets; the Royals’ catcher, Salvador Perez, was at the plate. Perez hit a grounder to third and David Wright fielded it, briefly looked Hosmer back to third, and then threw to first baseman Lucas Duda for the second out.